As I type this and think about these tasty millionaire's shortbread I made recently, our kitchen is a gutted, dusty space...renovation has begun! I'm taking it one day at a time and trying to just go with the flow. I'm thankful to be able to have an updated kitchen to cook and bake from soon, and also grateful I had the chance to make a few more delicious things to eat before we packed up the kitchen and got things ready for the construction! I've heard about millionaire's shortbread for a while now and I figured it was a great indulgence to attempt to make during the holidays to share with friends. It's made up of a base layer of buttery shortbread, a center of soft and chewy homemade caramel, and a top layer of dark chocolate. It's essentially homemade Twix bars. As my husband says, it tastes like a "fresh Twix bar" or a "fresh, gourmet Twix bar". 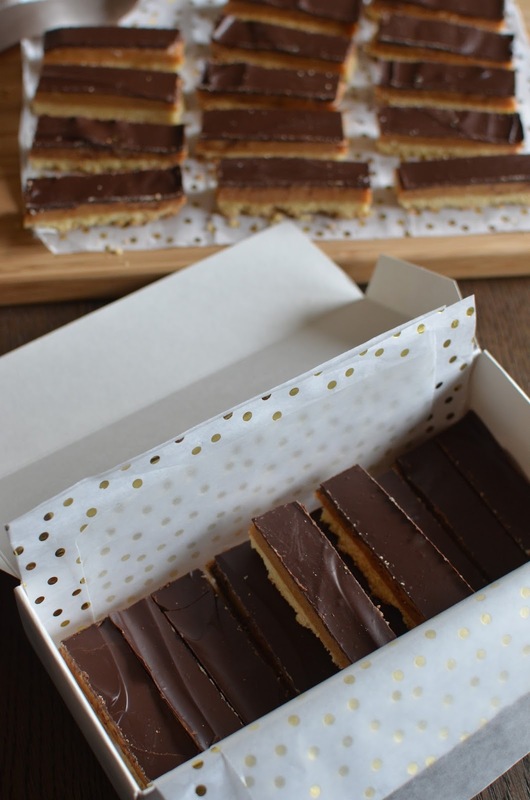 Well, I think Twix bars are pretty good as it is - it's a childhood favorite of mine - but this homemade millionaire's shortbread is a knockout indulgence! This is the recipe from Cook's Illustrated. It's actually fairly easy to follow - the only "must" is a candy thermometer for cooking the caramel layer to ensure that it turns out smooth, soft, and chewy. Using melted butter for the shortbread base, you can just stir the ingredients together and then simply press the crumbs into the pan. Finally, it takes a little time and effort to finely grate some of the dark chocolate that goes on the top layer and then to carefully - and slowly - melt the chocolate in the microwave for you to end up with a firm coating of chocolate that has a nice snap and won't bloom (turn gray). Following the directions, this was as close as I ever got to tempering chocolate and I was very happy! My bars aren't nearly as neat as the ones made by Cook's Illustrated but I can't say I'm too surprised. I had trouble slicing the bars without making a ton of crumbs in the shortbread layer (and frankly, I was too impatient to try a little harder). I'm fine with a little mess. I packed up most of my batch for a few friends (the recipe makes a generous 40 bars so it's great for gifting) and I don't think my friends minded the mess, either. I don't often eat a Twix bar these days but making these homemade bars was a great reason to indulge. These millionaire's shortbread bars were so addicting. The combination of buttery crunchy shortbread crust, with stretchy, sweet, and chewy caramel, wrapped up with a firm snappy dark chocolate top is a really winning combination. This is the perfect time to make a batch! Come November, I start craving those holiday spices we're all familiar with. Since we're comfortably into December already, those cravings are at a peak! It's so wonderful to bake something and have the aromas of warm spices like cinnamon, cloves, and ginger swirling in the air. Sugar and spice really does make everything nice! To get some of those holiday spices in the air - and for a taste of those yummy flavors - I made a batch of gingerbread biscotti. 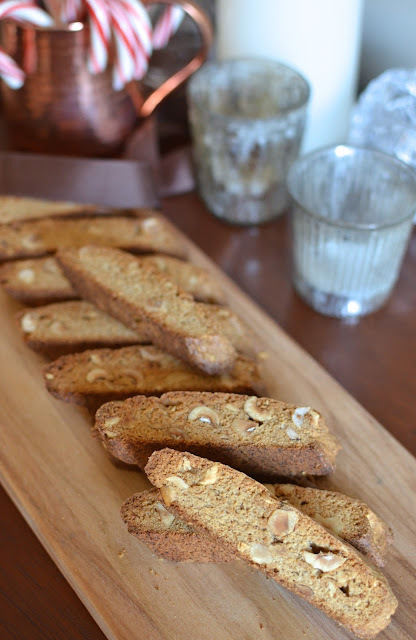 To me, biscotti is just a great snacking cookie to have around all year round. I really love making and eating them; they're not too rich but so satisfying, and go ever so very nicely with a warm drink. I added toasted hazelnuts to these gingerbread biscotti, which are flavored with ground cinnamon, ginger, cloves, and a few grinds of black pepper. The mix of these spices with dark brown sugar as it bakes makes an intoxicating aroma. The holiday flavors definitely come through! You can omit the hazelnuts but I think biscotti and nuts just go together. The hazelnuts add a layer of richness to the cookies in a healthful way. Since this batch of biscotti has a little bit of butter in it, they are crisp and crunchy, as you'd expect, but maybe not quite as intensely hard as the biscotti that do not have butter. I used to be firmly in the "no-butter in biscotti" camp but I've come around and now really enjoy both. I couldn't resist dipping some of my gingerbread-hazelnut biscotti in dark chocolate. I think that white chocolate might have been more visually appealing but I'm all about the dark chocolate so I went with what we like to eat. And I must say...I really, really loved the chocolate dipped ends of the biscotti! That's probably not surprising given the well-established delicious pairing of chocolate and hazelnuts. If you're looking for a cookie option that's fit for the holidays but not quite so rich, gingerbread biscotti is a great one. It's also just a great cookie to have on hand right now for snacking or everyday dessert...the gingerbread flavors put me in the holiday spirit while the nice crunch of these cookies always perk me up (so I'm ready for more holiday shopping)! A couple of years ago, I had a craving for cinnamon rolls and found a small batch recipe that I adapted. Since then, my family and I have been hooked and you may have seen me make versions from Nutella-hazelnut to one featuring an almond paste filling. With the holidays, I always think about chestnuts and I got to thinking that I should use some of my chestnut cream as a filling for my next batch of cinnamon rolls. So this batch of cinnamon rolls with a chestnut cream filling - and a little chocolate - was born and it was a hit at my house...though I have to say that every version of homemade cinnamon rolls has met with approval here! It's a special morning we look forward to when there are homemade cinnamon rolls coming out of the oven for breakfast! There's nothing like enjoying them warm. The rolls themselves are super soft, tender, and squishy. 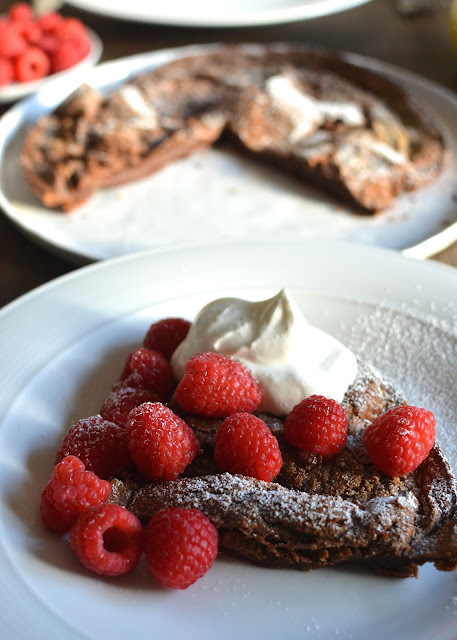 The filling here is simply chestnut cream, with a modest amount (a scant ounce is enough) of finely chopped dark chocolate, and, of course, a touch of cinnamon. My family and I really enjoyed the flavor; the chestnut cream provides a wonderful nutty sweetness and the chocolate melts and turns the filling into a marvelous chestnut cream-chocolate paste, that is very enjoyable. To make things extra sticky, sweet, and tactile, I topped the warm rolls with a simple chestnut glaze I made with a little confectioners' sugar, low-fat milk and a little more chestnut cream. Oh my...this was another great use of my chestnut cream stash. 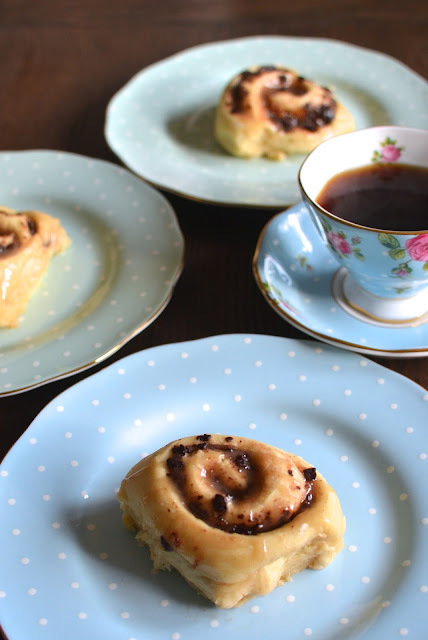 Like all delicious things, these cinnamon rolls vanished all too quickly. We find ourselves whipping at the last bit of sticky glaze from our plates and wondering when we can have cinnamon rolls again...it's a recurring thing around here.